Dog Owners | Got Barking? 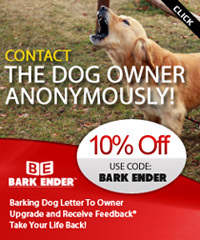 Have you been contacted by a neighbor, or received an anonymous letter regarding your dogs barking? Click Here for more information. Pet ownership is a huge responsibility. Only you can control what your dog does. Controlling the amount of noise that your dog makes will not only make your home more enjoyable, but your neighbor’s will really appreciate it. Are you aware that “Nuisance Dog Barking” is against the law in most areas? Are you aware of your local dog barking laws? Visit Animal Control page for more information. There are several steps that you can take to reduce or eliminate your dog’s excessive barking. The first step is understanding why your dog barks so much, and then deciding what type of corrective action to take. A protective dog will bark to alert their owner of any potential danger or threat. But many dogs bark due to boredom, loneliness, alarm, fear, and/or separation anxiety. Determining why your dog is barking will allow you to take the necessary steps, to not only eliminate nuisance barking, but to stop or reduce the cause of the barking. Obedience training is by far the best and most humane way to reduce or eliminate nuisance barking. It will take time, effort and dedication, but you can “Bark Train” your dog. Two basic methods to bark train your dog include putting several pennies in a can and shaking the can when the dog is barking. The other is to spray water in the dogs face using a spray bottle. The key to these techniques working is consistency, dedication and rewarding your dog when the barking stops. There are many resources available online, including books, videos and dog training manuals that will help you understand how to “Bark Train” your dog. Contact a local dog trainer or obedience school if you need assistance. Visit our Video Page to view bark-training videos. If you do not have the time or patience to “Bark Train” your dog, bark control collars can reduce or eliminate nuisance barking. There are three main types of bark control collar: citronella spray, shock and ultrasonic. In studies, citronella spray collars have proven more effective than shock collars. There are many devices on the market that emit either an ultrasonic noise and/or an audible noise when your dog barks. The different types of ultrasonic devices range from units that you mount on a wall or post that are triggered by your dog’s barking, to hand-held units that you activate when your dog barks. Being aware of your dog’s barking, understanding why your dog is barking and then taking the necessary steps to reduce or eliminate nuisance barking is the most effective way to solve your barking problem. Below are a few pointers and tips to help you reduce the amount of noise that your dog makes. Provide your dog with plenty of daily exercise. Provide chew toys that dispense food such as peanut butter or dog treats. Do not reward your dog when barking. Do not leave a barking dog outside for extended periods of time, especially at night. Owning a dog has many rewards such as companionship and protection. Most dogs are considered a part of the family. Along with these rewards comes great responsibility in providing for the health and well-being of the animal. But a greater responsibility is in ensuring that your dog does not disrupt the health and well-being of your neighbors. “Nuisance Dog Barking” is against the law in most areas for this very reason. Barking dogs are one of the most common complaints between neighbors. Be a responsible pet owner and good neighbor, be aware of how much your dog barks, and remedy the situation if there is a problem. If you are not sure if your dog barks when you are away or at night, approach your neighbors and ask them if your dog barks excessively. Let them know that you’re going to address the problem if there is one.